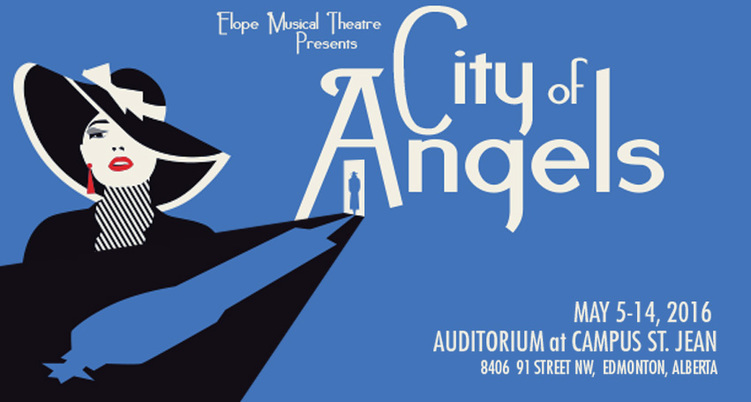 CITY OF ANGELS is the rarest of musical comedies; one that is not only loaded with music and written in the contemporary jazz idiom, but also filled with sidesplitting comedy. Set in the glamorous, seductive Hollywood of the 40′s, the world of film studios and flimsy negligees, the show chronicles the misadventures of Stine, a young novelist, attempting a screenplay for movie producer/director, Buddy Fidler. Every movie scene that Stine writes is acted out onstage by a group of characters whose costumes are limited to various shades of black and white. The same is true of the sets in which they appear and the props that they use. With music scored in the genre, we are, in fact, treated to a live version of a 1940′s private eye film. It is a tale of decadence and homicide with a liberal sprinkling of femmes fatale.